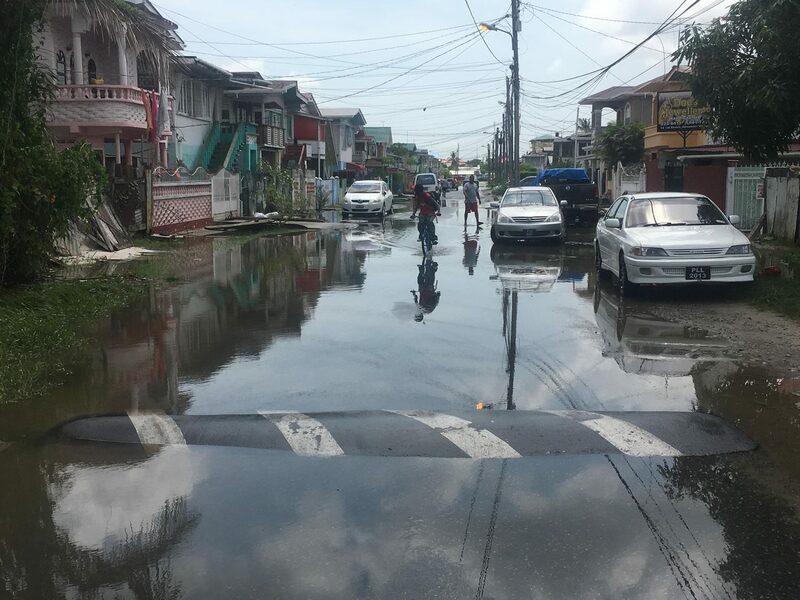 Residents of River View and the surrounding communities were plunged into confusion on Tuesday night and yesterday morning after their yards were inundated after the River View Koker was left open during the rising tide. 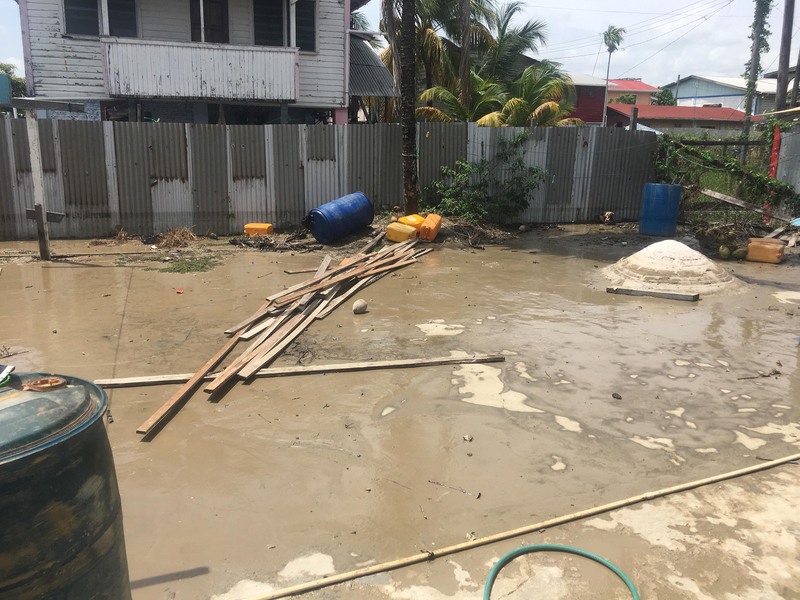 When Stabroek News visited River View yesterday, residents’ yards were decorated with furniture and electronic equipment, and completely covered with mud which had been swept in by the floodwater. The area was alive and busy, as persons came together and worked assiduously to assist each other with cleaning and removing goods and other valuable items from their houses. 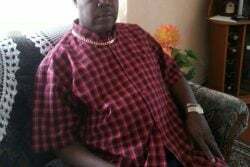 Town Clerk, Royston King related to Stabroek News yesterday that there was “some challenge with closing the door of the koker” but could not confirm what had caused the challenge. 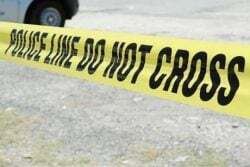 As such, a full-scale investigation has been launched to ascertain the cause. “In the mean time we will take actions against those employees who were supposed to be on site during that period of time, but this is all I can say now. We regret and wish to apologize to all of the residents who are affected and have sent out our technical people to do an assessment of damage to private property and [it] will be forwarded to our council for determination,” he said, while highlighting that compensation to the residents will have to be deliberated on by the full council. However, he added that they will be assisting the residents with materials and equipment for their clean up. 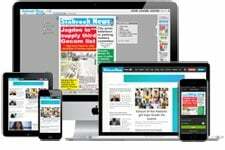 The severity of the sudden flood forced schoolchildren to stay home and assist their parents, as some of them were unable to get a full night’s rest. 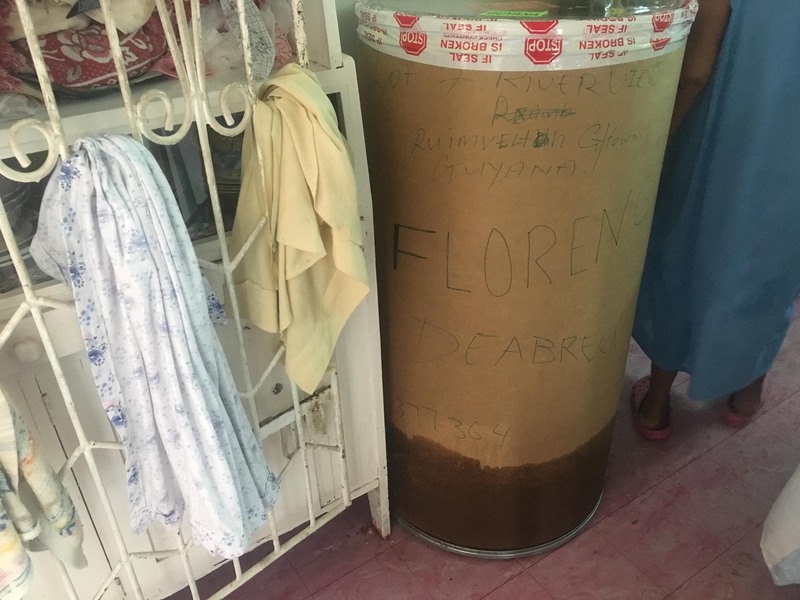 According to information reaching Stabroek News, while the koker’s door was supposed to have been closed at 10:30 pm on Tuesday, it wasn’t until around 12:30am yesterday that residents became aware that the door was still open, and the community was now at the mercy of the rising tide. 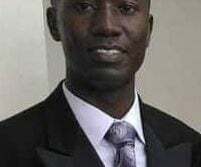 “The man [koker attendant] drop asleep and the checker supposed to leave Meadow Bank and check but he didn’t come either. 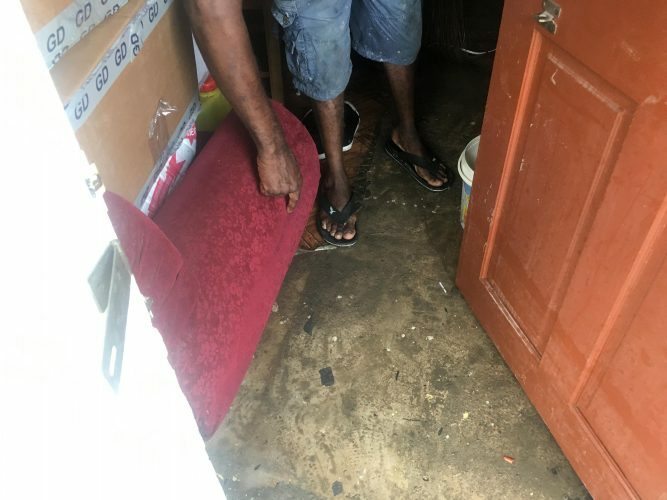 I come home and the water start coming in, and it de done deh in the yard all over… So I check fast and see how fast I coulda pack up me things but I couldn’t have packed up all cause the water de rising too fast,” David Gomes, a resident of River View related to Stabroek News yesterday morning. Gomes was in the process of cleaning the “thick mud” from his yard while his wife, Aretha, and their son were cleaning the house. 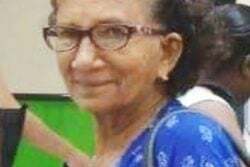 The family explained that they were not even sure of the extent of the damage since they were still in the process of checking what the floodwater had touched. According to Gomes, their refrigerator and stove, which were bought two weeks ago, had been sitting in one foot of water for hours, and were currently not working. “Water go in the cabinet. I bought the stove cause it’s my son’s birthday this weekend and I wanted to bake some cake and what’s not for him, but now it’s not working and I don’t know if it completely damaged or just have to dry off,” Aretha told this newspaper. 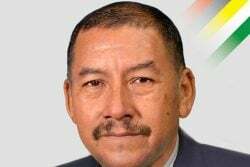 While the cause of the flood is still uncertain, Gomes explained that he is sure that it was the attendant who fell asleep and left the koker door opened. “Many nights I does wake them up, everybody knows it. I living here and I know the tide and I does got to go to wake them up, and he try at 12:30am to shut it, but he couldn’t make it after that, cause the tide de too high,” the man explained. Another resident, Trevor Spencer, a cook at Hotel Tower, explained that he had to take the day off from work so that he could clean his entire house and sort out what is damaged. 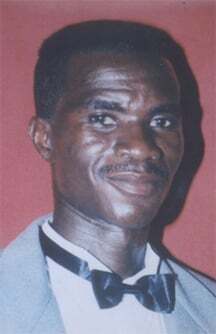 The man related that he was sleeping at the time the water started to invade the community and was alerted by his neighbour, Gomes. “The whole couch is wet. Water got into the fridge, the gas stove not even working and I had to take the day off and lose a whole day’s pay. 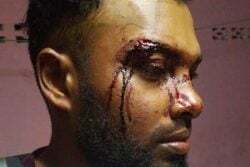 It’s really uncomfortable what happened and with these things that are damaged now,” he said, while adding that he wishes if the authorities, including the Mayor and City Council (MCC), who are in charge of maintaining the integrity of the koker, could offer the residents some compensation for their damaged properties. 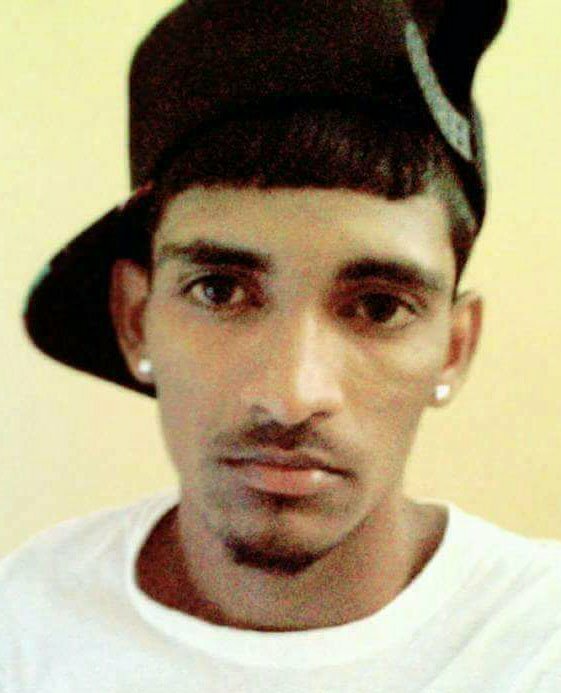 Regan Rodrigues, another resident of the community, said he was frustrated that such an incident had to happen, and that he was even angrier that only after tragedy had struck that the MCC decided to start cleaning the drains and clearing blockages in the area. “Look at how many people things damaged. Who gonna give account for all these people things that damaged? Let the people who control the koker come and help these people out. People got little children that go to school and me ain’t lose nothing, but I feel for the people. 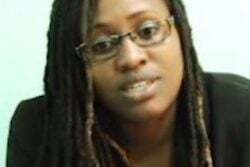 Children got to go to school but now you have to use that school money to clean your house and to get back things for the house,” Rodrigues told Stabroek News. Another resident, Winston [only name given] described the morning as a disastrous one for the people of River View. 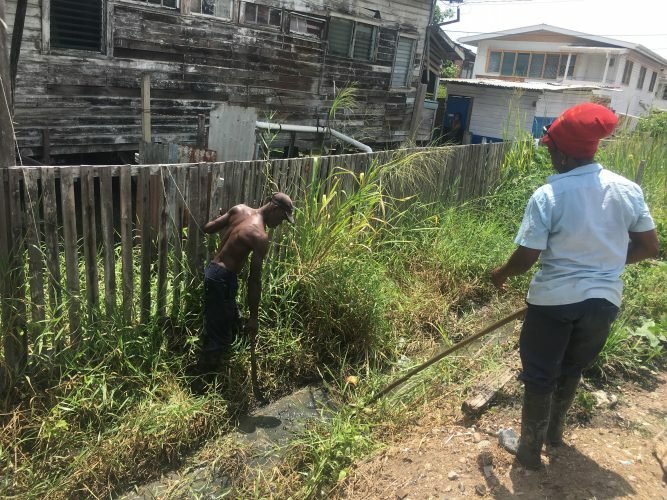 “The whole yard full of bare mud right through and I come home and meet about a foot or more of water inside my house and I am appealing to the authorities if they can do something in relation to the people facing this serious, serious flood situation,” Winston said. 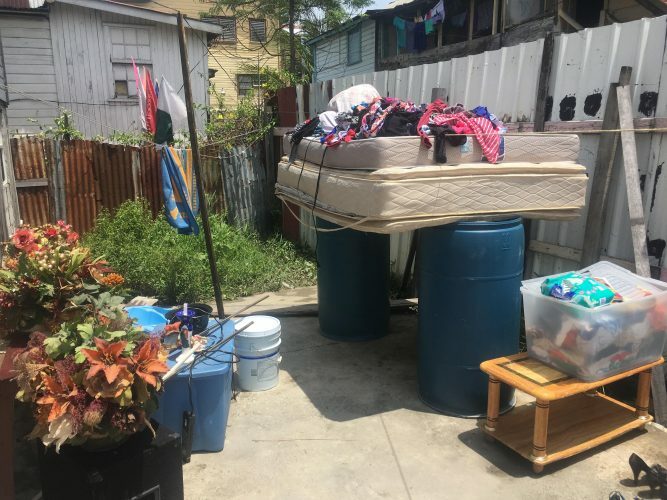 “I woke up at two this morning and my place was completely under water, and as soon as I put my foot down the whole thing cover up in water and I just jump on my table and start crying, because I thought it was the hurricane reach this far,” another resident said, while stating that she had to skip work in order to clean up her house, and was at risk of losing her job. “What gonna happen to us now? They sending relief to people overseas that get hit by the hurricane and now people over here in trouble and need assistance. What they gonna do? 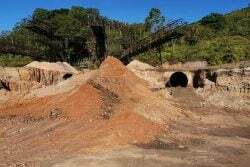 We know is the City Council that in charge of the koker and is they fault, but is the people suffering and the government and the President and everybody else got to care for we and do something, and that is what we waiting on because is not we fault that this happen. We just here peaceful trying to sleep and we had to get hit by this disaster,” another resident explained to Stabroek News. 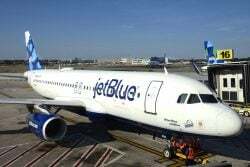 The residents’ expenses have mounted up to hundreds of thousands of dollars, as most of their refrigerators, stoves and other electronic equipment that were on the ground were damaged, some beyond repair. Some residents also explained that they have lost clothes, including their children’s school clothes, and valuable school books. “My children can’t go to school because they were up all night, because of the flood, and their books and clothes everything wet up,” another resident lamented. 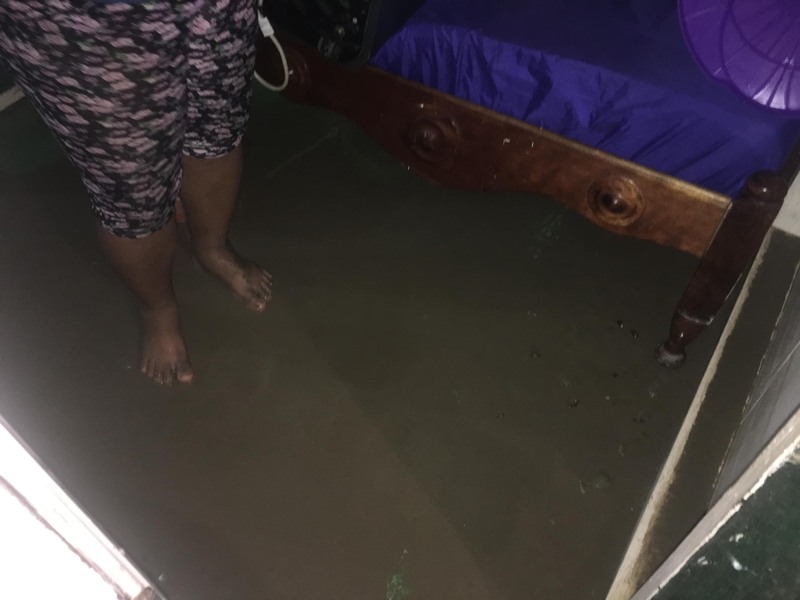 Even though River View faced the brunt of the flooding, other communities such as Alexander Village and parts of West Ruimveldt were also flooded for several hours. The water started to recede early yesterday morning around 6:00, and by 10:30 am it had receded in most parts of the communities. 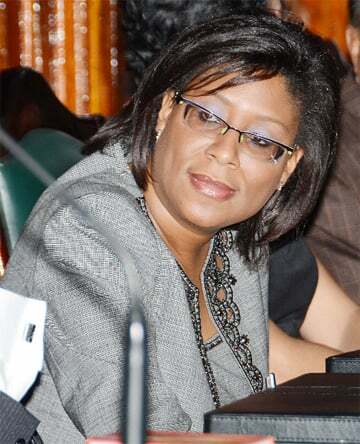 According to the residents, the Mayor, Patricia Chase-Green had visited the area and had promised to assist them with the cleanup. After the floodwater had receded, City Council workers were seen cleaning several drains in the area, which the residents say they are thankful for, but they are of the opinion that it should’ve been done prior to the flood, as the clogged drains and waterways are the reasons why the area flooded as easily as it did.